It is no secret that my other half and I enjoy a good pizza. There has been many a night out, hungover Sunday or random Thursday that has ended with two red boxes filled with dough and cheese. I like my pizzas groaning with veggies and chicken, whereas Luke goes for the choice with the most amount of meat piled on top. I think he does this on purpose so I don’t sneak a slice of his. Grr. Which is why, for the past month, I have teased him with texts, Facebook messages and calls, begging him to let me have a cheat day and order pizza. Yes, that’s right folks. This pudding is most definitely spongy and sadly, on a diet. After a fabulous birthday weekend in which we ate our way around not one but two cities, we decided to go on the straight and narrow until our holiday in October. After a questionable foray into paleo (what, I can’t eat anything?!) I decided to cut the crap (and the carbs), reduce the dairy intake and hike up the vegetable count. Throw a running challenge into the mix (31 miles this month!) and I think we’re onto a lifestyle winner. My ad-hoc diet has allowed the odd treat though, and aside from my very restrained way of eating a Crispello (seriously,I still have two pieces in the fridge from like three days ago!) I’ve decided that pizza can occasionally creep onto the menu. 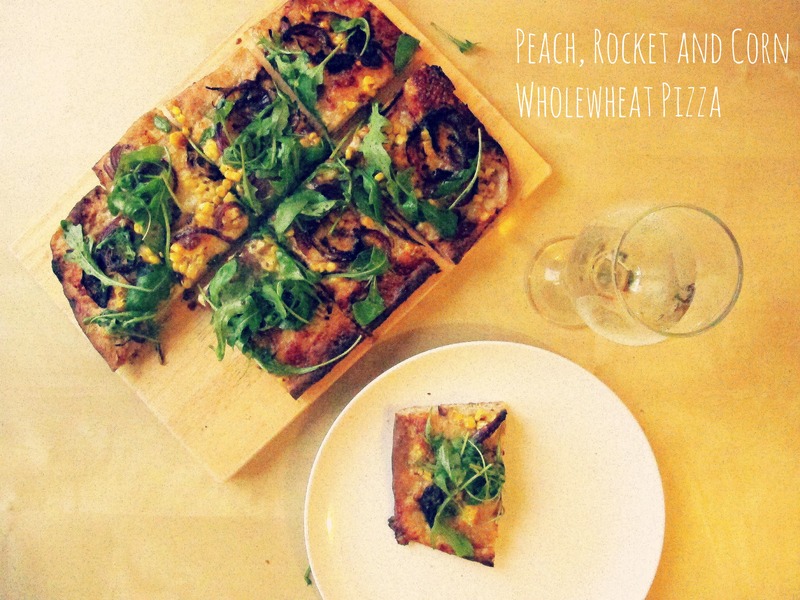 Pitching a fruit based pizza to a boy who shudders at the mere thought of a Hawaiian was always going to be tricky, but after two round of this peach-a (boom boom) I think I’m onto a winner. 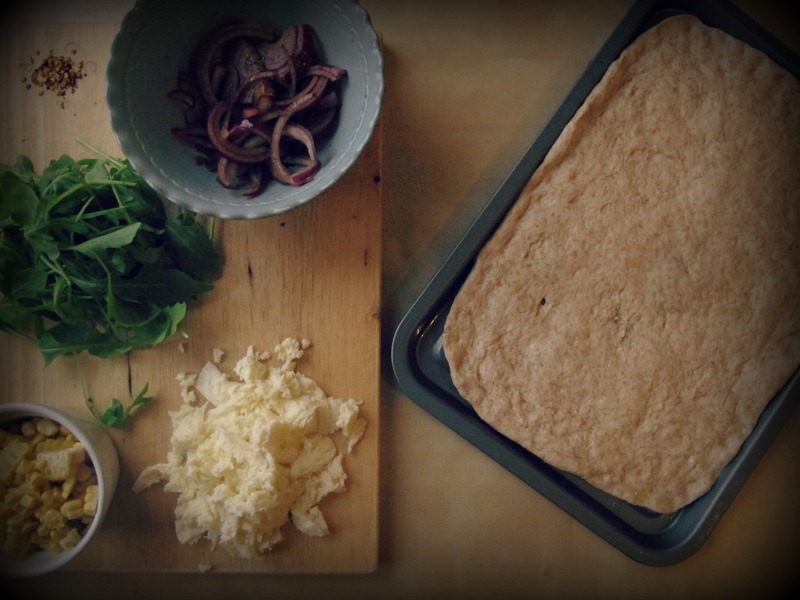 I added a little wholemeal flour to my favourite pizza dough to make it a tad healthier and I love the result – the earthiness combines so well with piles of peppery rocket and balsamic onions. 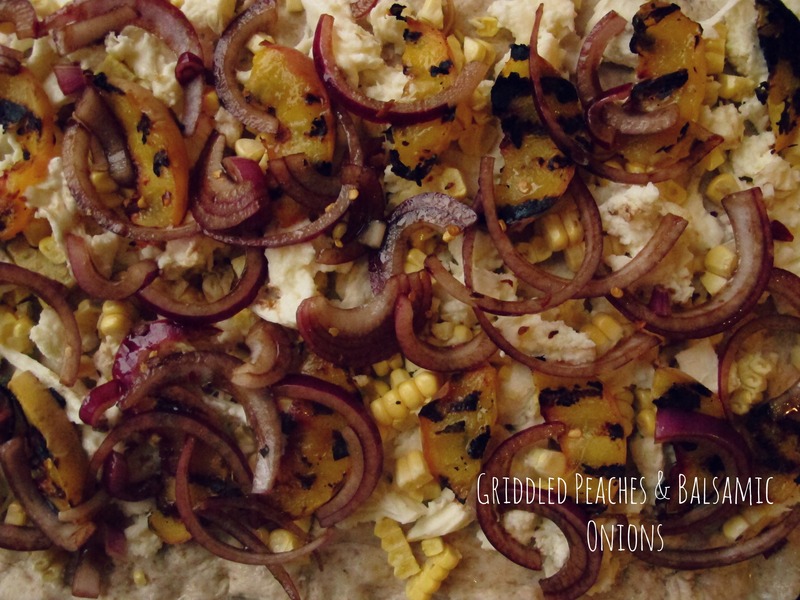 Fresh corn is always a treat on a pizza and the char-grilled peaches bring a smoky taste to the table. Finished with a dash of spicy chilli flakes, this pizza is worth shelving the diet for – even if it’s just for one cheat day. In a large bowl, mix together the two flours, salt, sugar and yeast. Pour in all the water and bring together with your hands or a wooden spoon. Turn out onto a clean work surface and quickly knead until the dough is combined. Place dough back in the bowl, cover with clingfilm and leave to prove in a warm place for two hours until doubled in size. After two hours, turn out the dough onto a lightly floured surface and divide into two. Leave to rest for a further 30 minutes. If you want to use the other dough a different day, wrap tightly in clingfilm twice then refrigerate for a day or freeze for up to a month. Remember to rest again before using as freezing can make the dough slightly sticky. Preheat an oven to 240oc/220oc fan/ Gas Mark 7. Place the onion slices in a bowl and cover with the balsamic and a drizzle of olive oil and leave to macerate. Place a grill pan over a medium heat and lightly char the peach slices. This step is great for softening under ripe peaches. Oil a medium sized baking sheet with the remaining oil and carefully stretch the dough to fill the tray. This will give a deep dish effect, but for a more Italian style, stretch further on a larger pan for a thinner base.On top of the dough, evenly distribute the balsamic onions, torn mozzarella and corn. 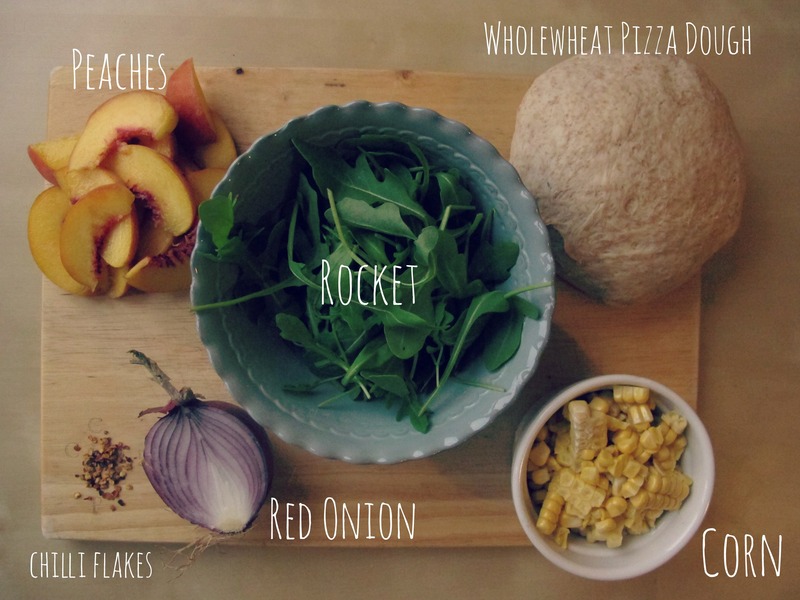 Arrange the peach slices on top of the pizza and sprinkle over the chilli flakes. Season and place in the oven for 15-18 minutes until the crust has risen slightly and the cheese is golden. Toss the rocket leaves in the remaining balsamic mixture and place on top of the pizza before serving. That looks very nice. I always do half wholemeal to half white flour for our pizza dough and I now find all white dough very boring. I think I will give this a try. It will only be for me – the others would object to the peach. Well, they’ll miss out. I was a bit sceptical, but I love the summery flavour of peach! I might up the wholemeal content the next time, thanks for the tip!